With all the snow we've been having, I've stayed inside re-working vignettes and moving "tons" of things around, working towards a more clean look around our home. The top of the antique dresser was first on the agenda of things to do this morning. I've gone crazy over silver trays since my visit to Atchison last fall. This tray was purchased at the Enchanted Frog an antique store chalked full of some great things. I think I gave $14.00 for it. I try to use books in almost any vignette I put together, whether old or new; I feel they add character and a bit of nostalgia. To the right of the mirror you'll find a sconce holding a plate, hidden from view a statue of a rabbit, to the left of the sconce is another vintage mirror. This area is a work in progress. As soon as it's complete I'll share the whole room with you. I know I've been saying that for a long time, but until I find just the right thing to hang on the wall, it will remain "unfinished". The little red checked chair found in the corner is my "official" reading chair. This is a picture of my mother and her sister, I've had for many years. I don't have many pictures of my family, those I do are cherished. I wish I had the love for a camera at a young age that I do now. This is so beautiful, Lynne! I love your pretty dresser and what a lovely vignette you've set up. I just love seeing the olden snaps of family! A beautiful vignette on a beautiful dresser, Lynne! Girlfriend, I nearly cried while looking through your photos! Of course, you know that this beautiful toile bedroom brings back a flood of RMS memories for me! We sure had some fun back in those days...didn't we? Hehe...I just realized that I am sounding like this happened years and years ago! It does feel like a lifetime ago to me...in many ways though! I just love this beautiful room, Lynne! Please do share more photos of it...it's a gorgeous room, my friend...and one of my "all time" favorites!!! Well my dear, I just adore this beautiful vignette that you created for your antique dresser! This dresser really is a gorgeous piece...I love it! And...your vignette just sings of sweet perfection!!! I love your silver tray! I too, have really developed a love for using them at my place! I love your worn but beautiful books...such beauty! Ohh my...and you know that I just adore your cherub...he's sooo pretty! I also really enjoyed the sweet little photo of your mother and aunt..precious memories for sure! Thank you so much for sharing your beautiful vignette with us...I hope to see more of this fabulous room...very soon, sweet friend!!! 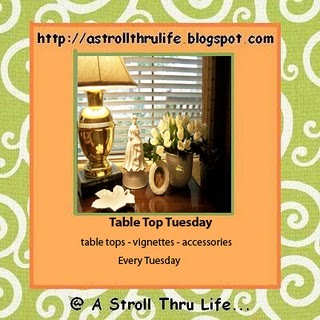 Love your antique dresser and your sweet silver tray. I've fallen in love with silver lately too. Isn't it amazing how everything comes around again. Great room! Everything looks great. I am now following along I found you from Marty. Come check me out if you get a chance. That dresser is so wonderful and your vignette is just perfect with the silver tray, books and old picture! I really love your vignette and that tray is fabulous! Your vignette is really pretty. That black dresser is gorgeous. You have the perfect reading nook. And I spied that gorgeous scounce on the wall. Beautiful! A very pretty vignette! Not a lot of pictures from my childhood either. What a lovely job you did one the dresser top. Just beautiful. I love the bindings on your books- so rich looking. Great vignette! That little lamp is my favorite! I adore vintage lamps with glass parts. The family photo is extra special, too! A friend is someone who will always be there...not necessarily, someone you have to talk to everyday...but someone you know is a phone call away, a note.....an e-mail or a blog comment. You know they are there for you. I've always known that about you. When I read your comment yesterday, I literally had tears in my eyes. I hope you know that I am here for you...you have a heart of gold & it shows in everything you do...right down to your beautiful vignettes. I hope that one day I can return the favor of your friendship~ you are a valued person in my life. Thank you for you!! A beautiful vignette and always love mirror reflections!